Walking Hadrian's Wall from East to West- itinerary successfully walked by the owner of Slightly Better Books! Includes where to start; where to stop and mileage! Walking the Roman Wall from East to West, From Tyne to Solway Firth- a guide from someone who's done it and loved it! 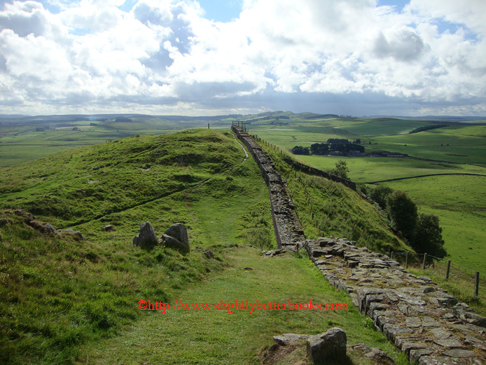 This is a suggested itinerary - way back in January 2010, I decided to walk Hadrian's Wall - it had been a long time coming; originally I had planned to do this epic trip in 2002, but Foot and Mouth disease had struck and closed a lot of the farms. It's 86 miles long and you can do it either way - from East to West or West to East. The prevailing wind is said to be from West to East, so many walkers prefer to do the walk in that direction; however...if you do walk that way, you end up in very urban setting at the end of your 86 mile trek (albeit in the wonderful Segudunum Roman Fort - an excavated and partially reconstructed (notably the Bath House) Roman fort complex. Segedunum, by the way, has an excellent museum and restaurant - perfect for walkers starting off on their day's travels and a welcome end point for those ending their walk. Hearty food can be had by all. I stayed in B&Bs overnight for the whole of the walk. To be quite frank, I did not want to do 15+ miles of potentially hard walking only to end up in a soggy campsite only to have to spend half-an-hour or more fiddling with a tent and then having to cook my own food on a tiny stove with raindrops hitting the canvas and the nearest toilet half a mile away. Room service and the company of others is everything! IMPORTANT: Some advice - do as much training as you can for this - get on the running machines in your local gym and do a bit of weights where possible - ask the fitness centre staff for advice on what you should do. You'll need to get your stamina up and build up your distance walking. The weight training will help strengthen your muscles, neck, shoulders and back for carrying a heavy rucksack 86 miles. How long does/did it take to walk? In the notes for accommodation below, I've noted where B&B's had baths & shaver sockets in their rooms. It's amazing how few Bed & Breakfasts have baths in their rooms, but equally it's amazing how much you need one after a day's hard walking. Sometimes a shower just doesn't do it! Please check with each B&B for their latest tariffs and availability. Where a B&B has a website, I have linked the name to their web page. Catch train to Newcastle, night time accommodation at the Dorset Arms Hotel, Dorset Avenue, Wallsend, Newcastle. NE28 8DX). Tel. 0191 209 9754, email: info@dorsetarmshotel.co.uk. I paid up front for this night's stay and paid an additional small charge for a fabulous cooked breakfast the next morning. It was clean, tidy and comfortable with shower and digital television and tea and coffee making facilities. I suspect that Hadrian's Wall walkers will not mind that it is about 15 minutes brisk walk from the centre of Wallsend! Had a shaver point (for recharging toothbrushes & electric razors!). My recommendation is that walkers staying in Wallsend overnight before setting out make their way via the Metro system out to Whitley Bay and that they effectively start their pilgrimage at the North Sea on the East Coast. There are plenty of places to eat there and a large beach to walk along to get your fresh North Sea and to stretch the legs in anticipation of the following day's walk. Before you start off, don't forget to pick up your English Heritage Hadrian's Wall passport stamp from Segudunum Roman Fort and Museum. Out of hours, it may be found in the TOTAL Petrol Station, 120 metres east of Segedunum Roman Fort. GR NZ 301 661. This part of the walk is very urban - you're really walking through Newcastle's suburbs and a little bit of its city centre. You cross over the A1M at one point and then some of it is along the Tyne River's north bank. There are plenty of places (pubs and restaurants) for the walker to get lunch at and places to shelter if it starts raining! This day's walking takes you from the north bank of the Tyne up onto the high ground just north of the river and you really feel like you're making a break away from the urban sprawl. The first town you come to is Heddon-on-the Wall, which has plenty of places in it to stop for lunch (if you feel hungry after your hearty breakfast) and it's shortly after you've left this settlement and enter the fields next to the A69 that you find the very first glimpses of Hadrian's Wall in the footings of the hedge on your right. This is a wonderful thing to see because a day and a half's walking in a very urban setting starts to make you question whether the wall actually exists. For me, this marked the real start of my walk, which was an exciting feeling. Night-time accommodation at Matfen High House, next to Matfen Brewery, NE20 0RG. Tel. 01661 886592. Just after the Robin Hood Inn, there is a sign pointing the walker down a path alongside a field and through a wood to Matfen High House, which is a beautiful country house with farmyard and barns run by Jenny and Struan. If you get there early enough, the brewery does food; otherwise, there is The Robin Hood Inn. No deposit required. This is a lovely, green day's walking, mostly through fields, all the time Hadrian's Wall is becoming grander and larger in its ditches and embankment, dominating stretches of the landscape. A good lunch point is at The Errington Arms, NE45 5QB. Tel. 01434 672250, which also offers accommodation. They're not always open on Mondays, but when I got there, the pub was "unofficially" open and serving plenty of walkers with lunches, teas and coffees, not forgetting lovely beer! Day 4 is quite a hard day, particularly if it's wet or windy weather. Much of it is up on the ridge top of the Great Whin Sill, a tabular layer of igneous rock (colled magnum or lava), so it's quite exposed and it's very up and down, so taking walking sticks, a first-aid kit and a charged-up mobile is well-advised. In terms of stopping for lunch, Housesteads Roman Fort (English Heritage) is a great spot to stop at, but there were not a whole lot of lunchtime food or drink options from the museum shop, nor places to sit down. Night-time accommodation at Burnhead B&B, Burnhead, Cawfields, Haltwhistle, Northumberland National Park, NE49 9PJ. Tel. +44 (0)1434 320841. E-mail: enquiries@burnheadbedandbreakfast.co.uk. A deposit may be required. Like day 4, this day's walking is quite long and, in places, arduous and the early portion of it remains on the Great Whin Sill, where the walking is exposed to the weather - sun, wind and rain! After Gilsland, it's green and rolling farmland and field. Make sure to spend some time having a look at Aesica Roman fort, which you meet almost immediately after setting off from Cawfields Quarry. There is a good place to stop for coffee and food with picnic benches just after coming down from the ridge into the basin of a former quarry, called Walltown Crags (1938-1978), where they used to quarry basalt. It has toilet facilities, and a shop with souvenirs, sandwiches, crisps and drinks, including a coffee machine. Lunchtime falls easily at Gilsland where there is a small town and The Samson Inn pub, which was serving some rather nice ales and food when I visited. According to Mark Richard's Hadrian's Wall Path book, there are a couple of other public houses and a teashop there. For the rail enthusiast, there are two crossings of the Newcastle to Carlisle railway in stage 19 on unmanned crossings. ***Sandysike B&B is perfectly placed (like Burnhead B&B) for Hadrian's Wall walkers, being almost directly on the Hadrian's Wall Path. It has a 10-bed bunkhouse and B&B rooms within the house. The room I had was on two levels - the upper part having the bed and bedside table, whilst the lower level of the room contained the ensuite bath and sink, which were very welcome. This is a working farmhouse and it was lovely to be welcomed so warmly into such a busy farm, where dinner was laid on (cottage pie), vegetables, gravy and all accompanied by a range of drinks from locally produced beer, to tea, coffee, water and juices (beer extra to the price of the stay). The evening meal is particularly necessary because there is nowhere else in Walton to eat of an evening since the pub closed down and turned into a tearoom. The family are friendly and welcoming and very accommodating and make an effort to bring all the walkers together and chatting round the large table in the spacious dining room. Extra entertainment was provided by some extremely cute puppies rolling around in one of the outbuildings carefully attended to by their labrador mother. Birdoswald Roman Fort is the 4th of the English Heritage Hadrian's Wall Passport stamps, the stamp being inside the fort within the shop area; when the fort is closed, it's located in an outside box. GR NY 615 663. A shorter and better (that is flatter and easier, if not greener and more sheltered) walk awaits you on Day 6, although you do end up having lunch later than normal unless you are a fast walker; and the weather holds up well. I took a mid-morning coffee break just after crossing the busy A689 on a small pedestrian bridge-there's an "honesty shack" here in an open shed complete with kettle, cups, milk, sugar and two refrigerators of drinks and ice-creams where you can shelter and make yourself tea or coffee, leaving the suggested monies in a pot in the shed. The walker is now entering the village of Crosby-on-Eden and there are a couple of walking facilities here - the Crosby Lodge Hotel welcomes walkers in for tea, and that's just a few yards on from here. The Eden part of the name comes from the River Eden, which is a prominent part of the walk on leaving the village and whose banks you walk along on several sections of the walk to come. Lunch is at the excellent Sands Centre which marks a well-needed rest point (I spent a long time resting here!) - hot and cold meals and drinks are available here in a restaurant which boasts internal and external seating, so the weary walker can get their fill of relaxation! Don't forget to get your Roman Passport stamp here. Night-time accommodation at Knockupworth Hall, Burgh Road, Carlisle, Cumbria, CA2 7RF. Tel. 01228-523531. E-mail: knockupworthdi@aol.com. Knockupworth is quiet and comfortable with the B&B facilities in an outbuilding at the back of the main house. It has a separate shower room, digital television and tea and coffee-making facilities (please check all details with the owner prior to booking) . There was also an amazing array of wild birds outside the window including the common woodpecker. This is partly due, I'm sure to the close proximity of the River Eden and the woodlands, fields and grassland along the river banks. The Sands Centre is the 5th of the English Heritage Hadrian's Wall Passport stamps, the stamp being inside the restaurant, GR NY 402 565. If the restaurant is locked, you may be able to gain access at the front of the building, but walkers should note that the stamp is only available during normal opening hours. 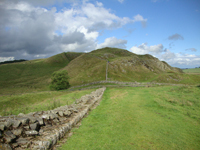 Despite the bittersweet happiness at having nearly completed the walk, this stretch of Hadrian's Wall is almost non-existent and there are few visible signs of it anywhere. The countryside is lush and green and there are plenty of spaces to sit and admire the view and at least two pubs to enjoy on the way to Bowness, where you can firstly refresh yourself and enjoy the cheesecake and coffee; and secondly have lunch and beer; and inadvertently a bit of a nap (you can see I enjoyed both pubs to the max). When you come into Bowness-on-Solway, the place you need to head for is The Banks, which is signposted to the right down a small pathway diving between two buildings. It's opposite The Wesleyan Home Mission Chapel and just before the post office. On the shoreline, the local residents have built a splendid wooden reception building complete with mosaic on the floor and plaques on the ends of the building giving the mileage of the Hadrian's Wall route. It sits in a beautiful, tranquil spot overlooking the Solway Firth and stands above a well and garden. Lunch: The Highland Laddie - lovely beers, sandwiches and hot food. It's a quiet and friendly public house in Glasson, stage 31 of Mark Richard's Hadrian's Wall Path book. Evening meal: The King's Arms, Bowness-on-Solway, which has a lovely range of home-cooked meals and great beers. The salmon was fresh from the estuary and cooked beautifully. Bowness is a great place for meeting other walkers in the pub all celebrating the end of the walk and from all walks of life and many different nationalities, confirming that the Hadrian's Wall walk has won its place in the international walking calendar. You could also try the Hope and Anchor pub, which is very popular and sits slightly outside Bowness in Port Carlisle. Night-time accommodation: at Shoregate House, Bowness-on-Solway, Wigton, Cumbria, CA7 5BH. Tel. 016973 51308; Email: bookings@shoregatehouse.co.uk. Shoregate House is a wonderful, friendly Bed & Breakfast on the right of Bowness just as you enter the tiny town. It has rooms with views of the sea, and the wonderful sounds of birds and wildlife can be heard across the estuary night and day (not noisy in the least, rather comforting in all). My room had a shower only, but was lovely and clean and comfortable with digital television. Getting the sixth and final Hadrian's Wall Passport Stamp. The passport stamp used to be kept in the wooden reception building, but was stolen; walkers will now find the stamp either in the King's Arms or the Community Centre round the corner.